The host broadcaster Bayerischer Rundfunk had commissioned TopVision to produce the world feed in 1080i/50 HDTV. Within the total of 27 cameras for the international signal (a mixture of Sony HDC-1000, HDC-1500 and HDC-3300 with Canon ENG/box lenses and Lemo connectors) a variety of special camera systems provided amazing views of the action. - Preparations for the 2013 Schladming Alpine World Championships,which will take place from the 4th – 17th February, are in full swing. The entire region is thrilled to be able to offer both athletes and guests a perfect platform for the event. Munich based company sono Studiotechnik GmbH has received the order to provide the IBC operations for the production. Kyodo Television is a company that brings together a wide range of activities including drama, entertainment, and documentary television programming, web and cell phone contents, the planning, production, and manufacturing of DVDs, videos and advertisements for business clients, event operations, and the detachment of announcers and so on. As Kyodo TV's specialty is relaying transmissions, Kyodo TV is also provising HD OB Vans, super slow motion OB Vans, and satellite communication news OB Vans provide a complete line up. We also have addition equipment such as character generator systems so we can handle all different scopes and subjects. Founded in 1992, NVP specializes in the production of live events. Professionalism, creativity, technological innovation - these are the strengths of our company. For over 15 years NVP has a passion for sports events, concerts, television programs, news, documentaries, movies, movie-making industry and live events in general. Customer care, design expertise, and constant technological updating make NVP competitive and appreciated; NVP is always attentive to the needs of a changing market. The OBS Unit is Ireland’s first dedicated broadcast audio truck. The unit is designed around an 80 sq ft Studer 5.1 Sound Bay. The Unit also provides a second production area. OBS provides the video, audio, & communications infrastructure along with a comfortable working environment required for multi camera “straight to tape” program making. In providing this infrastructure OBS facilitates the system used by many productions in the past. Until now, however, large scale OB sound, comms and facilities weren’t available in such a system. The production bay has the current capacity to monitor 12 1080p HD video signals. Additional video signals can be accommodated. The bay has full production talkback using a RTS Zeus Digital Matrix & 5.1 Genelec monitoring. The GCC Summit was organized on 24 December 2012 in Manama, Kingdom of Bahrain. The GCC regroups 6 Middle East countries: United Arab Emirates, The Kingdom of Bahrain, The Kingdom of Saudi Arabia, The Sultanate of Oman, Quatar and Kuwait. This year, the Summit was organized by the Information Affairs Authority of the Kingdom of Bahrain. This year the Information Affairs Authority of the Kingdom of Bahrain decided to choose the Belgian company Alfacam to cover the summit. Alfacam was present on 24 December in Manama and covered the 3 main locations of the summit: the Shakir Palace, the Shakir Airbase and the Media Center at Gulf Hotel. TV 2 is a publicly owned television station in Denmark based in Odense. The station began broadcasting on 1 October 1988, thereby ending the television monopoly previously exercised by the Danmarks Radio (DR). TV 2 has five subsidiary stations known as TV 2 Zulu, targeted at the youth, TV 2 Charlie, oriented towards older audiences, TV 2 News, a 24-hour news channel (launched on 1 December 2006), TV 2 Film, a non-stop movie channel (launched on 1 November 2005), and TV 2 Sport, a dedicated sports channel, as well as the internet-based pay-per-view channel TV 2 Sputnik which started broadcasting in December 2004. TV 2 has about 1,000 employees and a revenue of 1.9 billion DKK (2006). The station has been a full active member of the European Broadcasting Union since 1990. The Turkish Radio and Television Corporation, also known as TRT (Turkish: Türkiye Radyo ve Televizyon Kurumu), is the national public broadcaster of Turkey and was founded in 1964. Around 70% of TRT's funding comes from a tax levied on electricity bills and a sales tax on television and radio receivers. As these are hypothecated taxes, as opposed to the money coming from general government funds, the principle is similar to that of the television licence levied in a number of other countries. The rest of TRT's funding comes from government grants (around 20%), with the final 10% coming from advertising. Affectionately known to local consumers as the "School", it was for many years the only television and radio provider in Turkey. Before the introduction of commercial radio in 1990, and subsequently commercial television in 1992, it held a monopoly on broadcasting. More recent deregulation of the Turkish television broadcasting market produced analogue cable television. Today, TRT broadcasts around the world, especially in Europe, Asia, Africa and Australia. Radiotelevizija Slovenija is Slovenia's national public broadcasting organization. Based in the country's capital, Ljubljana, it has regional broadcasting centres in Koper and Maribor and correspondents around Slovenia, Europe and the world. The television division carries the name Televizija Slovenija or TV Slovenija. There are 3 national and 4 regional radio services, which can all be heard online as well. RTV Slovenija also finances the RTV Slovenia Symphony Orchestra and the Big Band RTV Slovenija. The legal foundation for the institution is the Radiotelevizija Slovenija Act (Slovene: Zakon o Radioteleviziji Slovenija). It is the only public nonprofit broadcasting organization in Slovenia to operate both radio and television stations. The law also requires it to air radio and television services for the country's two indigenous linguistic minorities, which it does in collaboration with the regional broadcasting centres in Maribor (for the Hungarian-speaking minority) and in Koper (for the Italian-speaking minority). Approximately 73% of RTV Slovenija's funding comes from television licence fees. 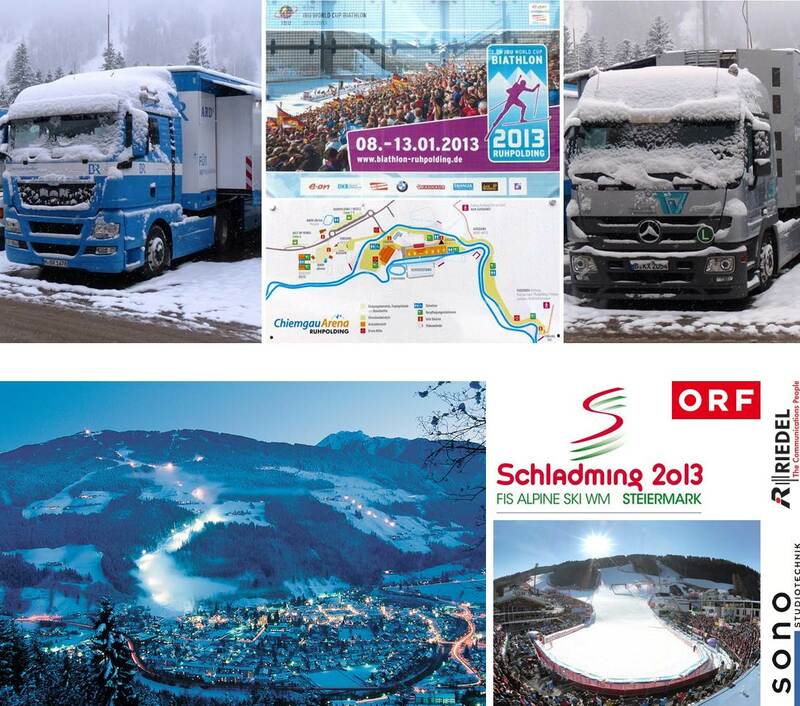 Munich based company sono Studiotechnik GmbH has received the order to provide the IBC operations for the production of the 2013 FIS Alpine Worldcup in Schladming. As part of the system sono will provide a production gallery for the live transmission of the daily press conference and take care of all fiber connections between the IBC and remote production sites “Planai” and “Medal Plaza”. Riedel Communications has been won as a sub-contractor for fiber links and intercom. The host broadcaster Bayerischer Rundfunk had commissioned TopVision to produce the world feed in 1080i/50 HDTV. Within the total of 27 cameras for the international signal (a mixture of Sony HDC-1000, HDC-1500 and HDC-3300 with Canon ENG/box lenses and Lemo connectors) a variety of special camera systems provided amazing views of the action of the biathletes: One camera on a MAT tower on top of the “Schießplatzberg”, one camera on a hot head on the track up to the “Schießplatzberg”, one more at the shooting range to get front views of the biathletes during their shooting practice, another one on the cable bridge behind the athletes to get close-ups of the targets and finally on a 35m high lighting tower for the beauty shots. Also two crane cameras were in action: a 12m crane was located at the “FischerS” and a 3m crane was serving at the shooting area, both were provided by FFL Rieger. Two HDC-1500 cameras were equipped with wireless adaptors from BMS and gave the necessary freedom for the shooting in the crowds and at the finish area. The Act 8 sailing finale was the culmination of eleven months of global touring to major cities for the eight Extreme 40 sailing teams. OC Sport has helped bring these events to worldwide audiences since the series inception in 2007. This past year, Maynard wanted to expand coverage by adding live webcasts so that fans could access the events on their computers, tablets, and mobile phones. Maynard explored several live streaming options, but says he kept coming back to Wirecast because it offered high production value at a competitive price. In addition to providing the professional broadcast look that sports fans have come to expect, it met his needs for a portable solution that could easily be carried from one location to another. Wirecast is a complete live video production software package which OC Sport runs on a laptop computer. Importantly for Maynard, it also provides the ability to output live streams to multiple distribution formats, and in Rio it was used to provide feeds over a LAN to onsite VIPs for viewing. Da Costa, one of Germany’s leading TV lighting designers, opted for Robe products because he’s used them before on several previous prestigious projects and knew they could produce the effects he wanted. Also because of their reliability and consistency. The full Robe count was 98 x ColorSpot 2500E ATs, 62 x ColorWash 2500E ATs, 26 ColorWash 1200E ATs and two ColorBeam 2500E ATs. Seventy-four of the ColorSpot 2500E ATs were rigged in the trussing system above the stage and the other 24 were hung on a matrix of towers behind the stage and around the central video wall. All 88 of the ColorWash 2500 and 1200E AT fixtures were also in the roof. The special Django Unchained white carpet spanned the top side of Leicester Square leading to the door of the cinema. Alongside the carpet, XL Events hung six vertical screens each made up of 12 tiles of Pixled’s lightweight, high-brightness F-12 LED. The screens displayed images of characters from the movie, as well as spelling out DJANGO. At the far end of the carpet a stage was situated which was used for celebrity interviews conducted by Alex Zane, host of the Guest List movie show on Sky Movies Premiere. The rear of the stage held 72 tiles of XL’s versatile Pixled FX-11, which showed character images and logos from the movie. Both the FX-11 and F-12 were chosen for their suitability for outdoor events. “I first saw the modular iLive system at a PLASA show a few years ago, so when the compact fixed-format iLive-T Series came along, I decided to take the plunge and purchase a system. It has eliminated a 20U rack of outboard at FOH, made the FOH footprint much smaller and made fit-up/get-out times so much quicker. The get-out on this tour typically takes less than an hour, with FOH being able to be packed away in ten minutes,” comments Andy Onion, Bugle Boy’s sound designer and operator. In the FOH rack is a rackmount PC that runs CSC show control software and iLive Editor control software to give an overview of what the system is doing, as well as system management software for 9 radio mics used on the show. The system is clocked from RME's ADi-648 ADAT/MADI converter, which takes the ADAT feed from the RME Fireface UFX audio interface and sends it to the MixRack onstage. British rockers Level 42 have been living up to their 1984 album Standing in the Light by performing under a rig of Clay Paky Alpha Spot HPE 700s at London’s Royal Albert Hall. The concert celebrated the 25th anniversary of the album Running in the Family, which produced hits for Level 42 such as ‘Lessons in Love’. During the show, the entire album was played, note for note, in order to recreate the joy of listening to this groundbreaking album, followed by an acoustic set and a final hour of other big hits, giving the whole experience a party feel. Last November, Vinny Osborne was on deadline, preparing for Singin' in the Rain to be performed by the Port Laois Musical Society in Ireland. He had a special need for an earset microphone which could better handle water immersion as well as deliver impeccable audio quality. The celebrated Irish sound designer—who has been nominated 11 times (winning seven) for Best Technical Award by the Association of Irish Musical Societies—got to work. He did his research, performed rigorous testing, and chose Point Source Audio’s CO-5w waterproof microphone for his lead actor. SOMMER CABLE offers the OCTOPUS HYBRID 443 cable as fully premade systems. Here the Straubenhardt-based manufacturer relies on the modular HAN-ECO connector from the HARTING company. The smallest possible connector housing with three module slots takes up the fibre-optical module (4 x SC-Ferrule), one Power/AF module plus the PE module. And all this in a housing that is only 80 mm wide. The multipin’s big advantage is that all connections (fibre-optics, mains supply and signal) are established via a single plug-in procedure and the cable end is equipped with a very efficient strain relief. Thus using our famous THE BOXX floor stagebox, a very robust breakout solution may be realised. Responding to ever-changing market requirements for more flexible, higher bandwidth and higher resolution live video productions, Kyodo Television recently invested in EVS’ XT3 server technology for its OB trucks. This enables them to switch seamlessly between SD, HD, 3D, 1080p and 4K live productions with just a simple reconfiguration of the server using the unique 3G in/out link. From Kyodo’s OB truck at Japan’s Sendai football stadium, two EVS XT3 servers were used to manage the 4K multi-cam ingest, recording and playout operations, enabling instant replays, highlights packages and slo-mos for the live 4K broadcast of the J League football match over 200 miles away in Odaiba. Driven by demand for larger screens, clearer pictures and the migration of gaming to TV screens, 4K will initially appeal to wealthy early adopters and companies, who will choose between 20 models on sale by year end, about half of which will cost less than £6,200. Commercial 4K broadcast and streaming services are not envisaged in 2013 and viewing will comprise pre-recorded or streamed content, dominated by movies. The coming year will see test broadcasts and new 4K cameras, with equipment costs set to decline. One current barrier to entry is bandwidth requirements and providers should monitor advances in compression technologies. Satellite-based broadcasters should be in a good position to offer 4K, with satellite capacity growing steadily. NSR's newly released UltraHD via Satellite finds, over the long term, UltraHD channels representing a respectable but niche opportunity for satellite companies. This nascent market is expected to start at a low base in 2015 with just 15 channels being demanded by the global cable TV, IPTV and DTH industries combined. The global satellite UltraHD market is expected to reach $412 million in 2025 from an $8.2 million revenue base in 2015. With ROI metrics being volatile in the early part of the market cycle, the expectedly small niche that UltraHD is likely to serve lends to the pay TV industry’s slow adoption of this new video format. One of the major market restraints is the level of risk taking by service providers, which is key to ecosystem development. TV manufacturers are one of the first to ante up as UltraHD TV sets from major manufacturers like Sony, LG and Samsung are being unveiled. Content including movies and sporting events, as well as cameras to shoot UltraHD, are already available.